Himeji’s chief attraction is Himeji Castle, a spectacular castle complex which is one of only 12 original Japanese castles to survive the last World War. 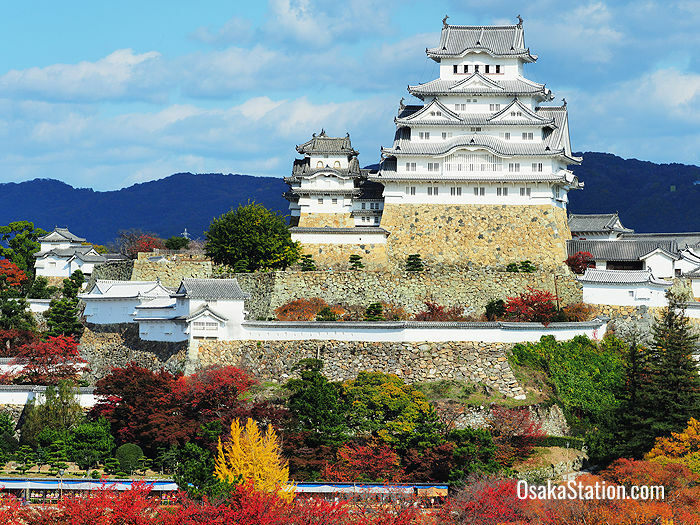 Famous for its outstanding beauty, Himeji Castle is one of Japan’s most popular tourist destinations. The city of Himeji is easy to get to from Osaka by either train or by car and so makes for an excellent day trip destination. In this article however, we will list some other attractions that may make you want to stay a bit longer. Himeji Castle is generally agreed to be Japan’s most beautiful castle. Though the castle’s history dates back to 1333, it was rebuilt, remodeled and expanded many times and its current form dates back to the early 17th century. Incredibly this architectural treasure survived a direct bombing in the last World War, when the bomb miraculously failed to explode. A renovation process that finished in 2015 has now left the castle’s shining white rooftops looking better than ever. 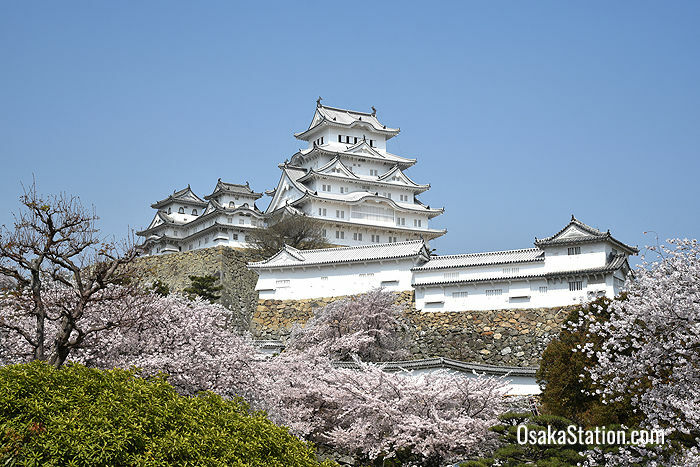 The castle is known as Shirasagi-jo or “White Heron Castle” because of its graceful appearance and is both a registered National Treasure and a UNESCO World Heritage Site. Viewing the castle can take up to 2 hours and during busy seasons you may have to wait as long as an hour to get in. The busiest times are during cherry blossom season in early April, and holiday periods such as New Year’s Day, the Golden Week holiday in early May, and the Obon summer break in mid-August. Entry to the main keep of the castle is a 1,000 yen for adults aged 18 and over and 300 yen for children. The castle is open from 9.00 –17.00 or until 18.00 between April 27th and August 31st. However, last entry is one hour before the castle closes. The castle is closed on December 29th and 30th. From Himeji Station it is a 20 minute walk or a 5 minute bus ride from the Shinki Bus Center outside Himeji Station’s North Exit. Kokoen Garden opened in 1992 and was developed on the site of the old samurai houses below Himeji Castle. It is actually a series of nine connected Edo era style strolling gardens which are divided by tile topped earthern walls that follow the old Edo era street plan. 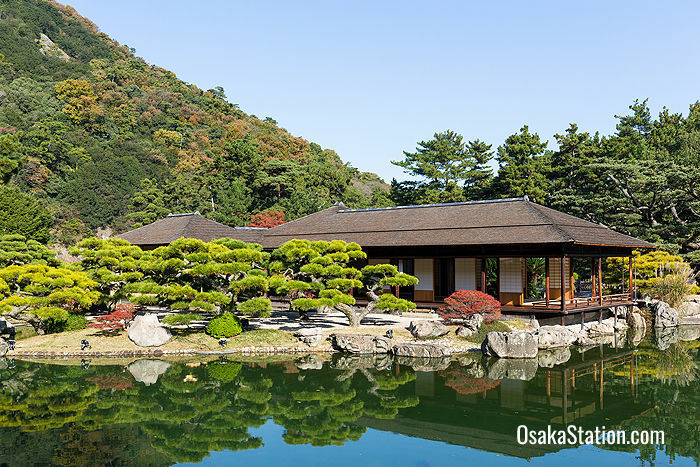 Inside the gardens are beautifully landscaped with ponds, waterfalls, and tea houses, and there is also a restaurant where you can enjoy tea or a bento style boxed lunch. From September 1st until April 26th the garden is open from 9.00 until 17.00 and from April 27th till August 31st it is open from 9.00 till 18.00. Last entry is 30 minutes before the gardens close. Kokoen Garden is closed on December 29th and 30th. Entry is 300 yen for adults and 150 yen for children (elementary, junior high and senior high students). A combination ticket that includes admission for both Himeji Castle and Kokoen Garden costs 1,040 yen for adults and 360 yen for children. Kokoen Garden is a 15 minute walk north of Himeji Station beside Himeji Castle Park, or 5 minutes’ walk from Himeji Castle. Shoshazan Engyoji is a large temple complex on top of Mount Shosha in the north west of the city. 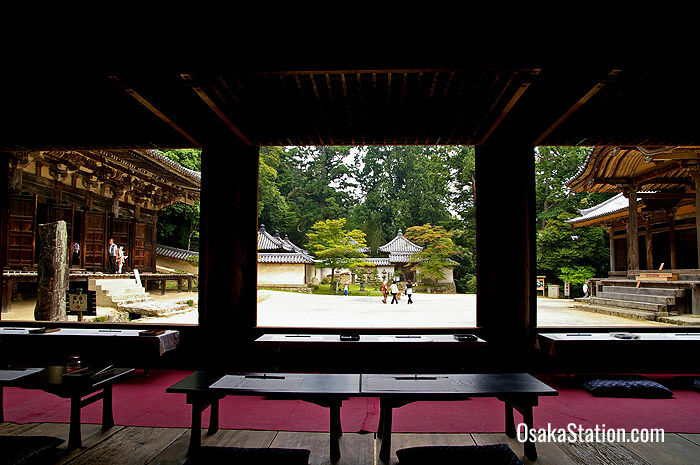 The temple dates back to 966 when the Buddhist saint Shoku Shonin dedicated it to the Goddess of Mercy. Viewing the many fine temple buildings among the natural scenery will take about 2 hours. It is also possible to take part in meditation or in sutra copying activities here. The temple is accessible by bus and ropeway. To get there take a Route #8 bus from bus stop #10 on the north side of Himeji Station. There is a round-trip discount ticket to Mount Shosha that includes the price of the ropeway. This costs 1,400 yen for adults or 700 yen for children. It takes about 30 minutes for the bus to reach the ropeway, and then 5 minutes to go up. At the top there is a shuttle bus that takes you to the temple in 5 minutes. The shuttle bus costs 500 yen for a round trip ticket, or you can save money and walk there in 16 minutes. However, you will still be charged a 500 yen entrance fee for the temple. Hyogo Prefectural Museum of History was designed by the famous architect Kenzo Tange. The museum has displays and dioramas in several sections explaining the history of Hyogo Prefecture, of Himeji City and its castle, of Hyogo festivals, and a children’s section with many antique toys. In the virtual reality theater you can watch a 3D presentation of Himeji’s history and there is another where you can dress up like a samurai or an imperial court lady. The museum is open from 10.00 until 17.00 with last entry at 16.30. It is closed on Mondays and between December 29th and January 3rd. Entry for the regular exhibition is 200 yen for adults and 150 yen for university students. Elementary, junior high and senior high students can enter the museum for free. The museum is a 10 minute walk north of Himeji Castle. Himeji City Museum of Art is a red brick Meiji era building to the east of Himeji Castle. It shows both local artists and the art works of European masters such as Monet and Rodin. It is open from 10.00 until 17.00 with last entry at 16.30. It is closed on Mondays and from December 25th to January 5th. Entry to the permanent exhibits is 200 yen for adults, 150 yen for senior high and university students, and 100 yen for elementary and junior high students. The museum is a 6 minute walk from Himeji Castle. Himeji City Museum of Literature has exhibits showcasing the life and work of nine local writers but does not have much English language display information. However, if you are interested in architecture you may still be interested in viewing the building itself. Designed by the renowned contemporary architect, Tadao Ando, the museum is a minimalist structure of concrete and glass intersected by pools of water. The museum is open from 10.00 until 17.00 with last entry at 16.30. It is closed on Mondays and from December 25th to January 5th. Entry costs 300 yen for adults, 200 yen for senior high and university students, and 100 yen for elementary and junior high students. The museum is a 13 minute walk west of Himeji Castle. Tegarayama Central Park to the south of Himeji Station includes an aquarium, a Peace Museum, a botanical garden and an amusement park which includes a Ferris Wheel, a series of pools with water sliders and wave-making machines, and other attractions for smaller children. The park is a 5 minute ride by bus or taxi from Himeji Station. Himeji Central Park includes a drive through safari park, an amusement park with a Ferris Wheel and roller coasters, a pool in the summer, and an ice-rink in the winter. The park is a 30 minute bus or taxi ride from Himeji Station. Round trip tickets are available from the Shinki Bus Center outside the station’s North Exit which include admission to the safari park and/or amusement park. Himeji City is very easily accessed from Osaka by train or by car. By train you have three options: the shinkansen from Shin-Osaka Station, the Special Rapid Service from Osaka Station, or a limited express from Hanshin Umeda Station. Of these choices the shinkansen is the fastest option and the limited express from Hanshin Umeda Station is the cheapest. However, as Hanshin Electric Railway is a private company it is not covered by the Japan Rail Pass. To plan a journey by either a regular JR train or by shinkansen use the online JR West Timetable and Route Finder. To plan a journey by private railways use Hyperdia. There are no direct bus services from Osaka to Himeji. Himeji is directly connected to Osaka by the Sanyo Shinkansen line. Traveling by shinkansen from Shin-Osaka Station you can be in Himeji in 30 – 40 minutes depending on the service. The fare for an unreserved seat is 3,220 yen and for a reserved seat the fare is around 3,540 yen. Reserved seat fares do change by the season, so you should check the exact fare on the day that you buy your ticket. This is definitely the quickest and most comfortable way to travel to Himeji and can also be economical if you have a Japan Rail Pass. However, please note that among the Sanyo Shinkansen services that depart from Shin-Osaka Station, the Nozomi and Mizuho services are not covered by the Japan Rail Pass. West bound Special Rapid Services on the JR Kobe Line run from Osaka Station to Himeji Station in around 62 – 64 minutes for a fare of 1,490 yen. These services are very regular but can get crowded between Osaka and Kobe, so you may have to stand for part of the journey. You can travel by a direct limited express from Hanshin Umeda Station in Osaka to Sanyo Himeji Station in Himeji. Both of these stations are convenient as Hanshin Umeda Station is right beside Osaka Station, and Sanyo Himeji Station is right beside JR Himeji Station. Limited express through services connect these two stations via the Hanshin Main Line, the Kobe Kosoku Line, and the Sanyo Main Line. This route is a little cheaper but the journey time is also a little longer. The fare from Hanshin Umeda Station to Sanyo Himeji Station is 1,280 yen and the journey time can be between 1 hour and 35 minutes or 1 hour and 52 minutes depending on the service. Please note that this is a private railway network so it is not covered by the Japan Rail Pass. Depending on traffic conditions you can drive from Osaka to Himeji via the Hanshin Expressway, the Kinki Expressway, the Chugoku Expressway, and Sanyo Expressway in around I hour and 10 minutes. Toll fees for this route will amount to around 4,530 yen. If you want to save some money you can go via the Hanshin Expressway, Kobe-Awaji-Naruto Expressway and Sanyo Expressway in around 1 hour and 23 minutes and pay around 2,880 yen in toll fees. Renting a car of course will cost you more. There are a number of reliable car rental businesses around Osaka Station. For more information on these, please see our article Car Rental in Osaka. Himeji City Tourist Information Center is located on the ground floor of Himeji Station close by the North Exit. The center has English speaking staff, free maps, free Wi-Fi, and a limited number of bicycles which can be borrowed for free. One ride costs 100 yen for adults or 50 yen for children. There is also a Day Pass which costs 300 yen for adults and 150 yen for children. The Day Pass includes some discounts on entry into Himeji Castle, Kokoen Garden, and Himeji City Museum of Art. The Himeji Transportation Guide is a detailed PDF from the Himeji City Tourist Site which includes maps and a table of bus and taxi fares for all the major tourist attractions. Article by Michael Lambe. Photos by bodebo/pixta (1), leungchopan/pixta (2), barman/pixta (3), okeitan/pixta (4). All rights reserved.